Kristin's Four Kids: Hooray for Mondays? 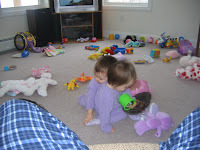 Yes, those are my babies, hugging. TOO DARN CUTE! And sorry, those are my husband's legs, in the way. Annie was all into hugging Izzie on Saturday and Doug managed to capture it (and his fleece covered legs) in process! The rest of my weekend wasn't that thrilling. Well, Auntie Nettie called to cheer me up from NYC on Friday night and that was quite nice. We hadn't chatted in awhile. She asked if I was going to have any more winter babies (!) since all my children are born in December or January (oh yes, spring is BORING in Maine!). NOPERS! We are all done, officially. Doug had the big V on Friday, and since he felt it necessary to tell everyone about it, I'm throwing it out there in bloggerland. And do you know what a husband with the big V can do for THREE WHOLE DAYS afterward? Hmmm, do you? That's right, nothing. No lifting of anything over 15 pounds (i.e., you, wife, shall carry all groceries, babies, middle children), no snow shoveling, etc. So I did laundry (which, got PUT AWAY! HOORAY! ), did the grocery shopping, wrangled children of all sizes and shapes and everything else all weekend. And I was dog tired (whatever that means). And then I read Swistle's post over the weekend and decided that she rocks. I took her advice and created a nice "Monday house" to wake up to today. Which my three youngest children managed to destroy in about 3 nanoseconds. At least for a few minutes it looked nice! And by "house" I mean the area that the general public can see~you know, the living room, kitchen and dining rooms. The upstairs of my house will continue to fester in filth. But I digress. No, I am not complaining that Doug had the big V. It was time, really, it was. And I am glad that today he is feeling better, back at work. But today I have four children at home instead of three. Megan is sick today with whatever version of the flu is going around her school. Poor thing~she sounds awful, with a nasty cough and sore throat. Which of course I am feeling like I have too. Joy. And she is sad, because today is Dr. Seuss's birthday and that meant Green Eggs and Ham for school lunch, and a celebratory birthday cupcake, and she is missing all of that. I will have to recreate that special lunch when she is feeling up to it. Ok, Blogger, why are there no spaces between my paragraphs? I see them here, but they aren't on the preview. Grrr. Do you hear me Blogger????? I am so glad you posted on my site, because it led me to yours! Your children are absolutely adorable, and how the heck do you do it, girl? I can't imagine twins PLUS two more! Your house in the background of the photo looks virtually identical to mine...littered with toys. The joy! Came over from Swistle's brilliant weekend post. My Monday mess is behind me...yeah, it was a three day weekend here, sigh! I have 15 more precious minutes before I need to turn around and face it. And see how much I can finish before dh comes home from work to collapse on the couch until bedtime. Hope the germies go away quickly for you. So that's why you were giggling when I so innocently asked you that question! Thanks for sharing. Really. I'll never see Doug *quite* the same way again ... though in time, I'm sure I'll get over it. Just like I did when my mother shared the same news with me about my father ... in the middle of the Temple of Dendur in the Met! Needless to say the halls of that o'temple heard a screech like something out of a horror film. Cute kiddos. Treasure that moment because I'm sure they'll be wailing on each other sooner rather than later. Sending some warm weather wishes your way.